I’ve been using Yahoo! web mail since 1999 or something around that. There was a time when it was slow and bloated and Internet connections were slow. At that time, first browsers that allowed to block images were a bless. Later, when Firefox came out and we were able to “block images from xyz site” it was really good. They soon replaced those with flash ads, but those were even easier to circumvent, either using flashblock or not installing flash at all. However, ads are not what’s bugging me. It’s the stupid new “Chat & Mobile text” box on the left side. I don’t want to chat, I want to read e-mail. Google Mail has a similar feature for some time, and it was driving me mad because it would change the size of the box at some point and move rest of the page below it, making me miss some clicks. Anyway, Google was smart enough to remove it (or allow us to remove it, I can’t remember). But Yahoo! seems to be a different story. The box just stays there, presumably drawing my bandwidth with some AJAXy calls. I have to press Cancel for it to stop. EACH TIME. This is really annoying. I search the options, and there doesn’t seem to be any way to turn it off. 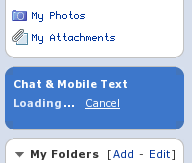 I understand that some people would like to chat while they are reading e-mail, but I’m not one of them. Why would I want anyone to know I’m online while I’m reading the e-mail. Can’t I just read my e-mail in peace and quiet? BTW, Facebook is plagued with a similar problem. As soon as you are logged in to read other people’s updates, someone of your “friends” might jump in to chat with you. So, the only way to work around this issue is to ignore them? How nice is that?